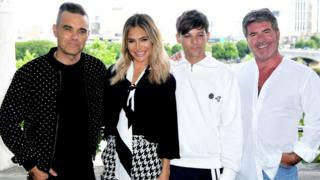 Robbie Williams is to join the X Factor judging panel when the show returns to screens this summer, ITV has announced. The former Take That singer, 44, fills the vacancy left by long-standing judge Louis Walsh, who quit the show last month after 13 years. Louis Tomlinson will join the panel along with Robbie's wife Ayda Field, and long-term judge Simon Cowell. Sharon Osbourne will also be a judge - but only on the live shows that follow the pre-filmed auditions. The new judging panel was unveiled in central London on Tuesday ahead of the auditions, which are set to begin later this week. One Direction's Louis Tomlinson, 26, will take up his position after finding fame on the show in 2010. The Back to You singer appeared as a guest judge at judges' houses in 2015, helping Simon Cowell select which of his acts he would take through to the live shows. Robbie's appointment, meanwhile, sees him emulate his former Take That bandmate Gary Barlow, who was head judge on the ITV show from 2011 to 2013. The star will be forced to miss a number of live shows because he is already double-booked with tour dates in South America. His new role follows his contentious appearance at the World Cup opening ceremony, during which he was seen to "flip the bird" on live television. Williams, whose hits include Angels, Millennium and Rock DJ, holds the record for the most number one albums by a British solo artist. The new foursome have been unveiled as part of a series of changes introduced ahead of the upcoming 15th season, made in a bid to reverse falling ratings. Image caption The departing Louis Walsh said the show "needed a change"
Williams married Field, a US actress and model, in 2010 - she has since found fame in the UK on ITV daytime show Loose Women. Judges' auditions for the new series will take place at Wembley Arena in north London. More than 30,000 contestants have already taken part in open auditions held across the country. Has original music saved The X Factor?